Key flow regions linked to jet noise sources are investigated through comparison of convection velocity and turbulence measurements in high-speed three-stream nozzles. Time-resolved flow imaging using a photomultiplier tube array was applied in the Nozzle Acoustic Test Rig at NASAs Aero-Acoustic Propulsion Lab to measure 250 kHz repetition laser scattering signals arising from seeding particles at 32 points in high-speed flow. Particle image velocimetry measurements previously reported by NASA provided mean velocity and turbulence intensity. 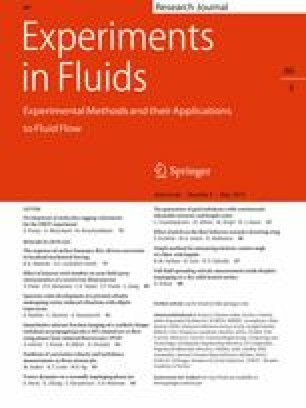 Results for convection velocity of the particle concentration field were obtained from the time-resolved data for three-stream nozzle configurations using a cross-correlation approach. The three-stream cases included an axisymmetric and an asymmetric, offset nozzle configuration. For the axisymmetric case, areas of high convection velocity and turbulence intensity were found to occur 4–6 area-equivalent nozzle diameters downstream from the nozzle exit. Comparison of convection velocity between the axisymmetric and offset cases shows this same region as having the greatest reduction in convection velocity due to the offset, up to 20% reduction for the offset case compared to the axisymmetric case. These findings suggest that this region along the centerline near the end of the potential core is an important area for noise generation with jets and contributes to the noise reductions seen from three-stream offset nozzles. The authors gratefully acknowledge a number of contributors to this work: the hard work in collecting the DGV data by Dr. Tobias Ecker; Drs. Brenda Henderson and Mark Wernet of the NASA Glenn Research Center for their support and for providing the PIV results; Profs. Philip Morris and Dennis McLaughlin for many insightful discussions on the mechanics of eddy convection and high-speed jet noise radiation; and sponsorship from the Office of Naval Research (Grants N00014-16-1-2444 and N00014-14-1-2836), program manager Dr. Steven Martens.